Close view of andesite lava flow Brokeoff Volcano, California. Andesite is a gray to black volcanic rock with between about 52 and 63 weight percent silica (SiO2). Andesites contain crystals composed primarily of plagioclase feldspar and one or more of the minerals pyroxene (clinopyroxene and orthopyroxene) and lesser amounts of hornblende. 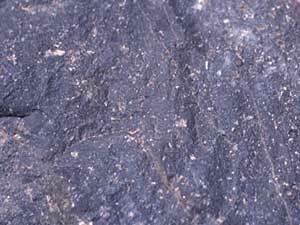 At the lower end of the silica range, andesite lava may also contain olivine. Andesite magma commonly erupts from stratovolcanoes as thick lava flows, some reaching several km in length. Andesite magma can also generate strong explosive eruptions to form pyroclastic flows and surges and enormous eruption columns. Andesites erupt at temperatures between 900 and 1100° C.
The word andesite is derived from the Andes Mountains, located along the western edge of South America, where andesite rock is common. Andesite was the main rock type erupted during the great Krakatau eruption of 1883.